Today is Aunt Daisy’s wedding and Nellie knows exactly what she wants to wear – and it’s not her flower-girl dress. An hilarious read-aloud story by the creative team behind the CBCA Notable Book, Whale in the Bath. “Today. Is. Dinosaur. Day!” I roared. Mum, Dad and baby Riley are all busy getting ready for Aunt Daisy’s wedding and no one has time to listen to Nellie. But Nellie can’t wear her flower girl dress today. Today, she’s a dinosaur. 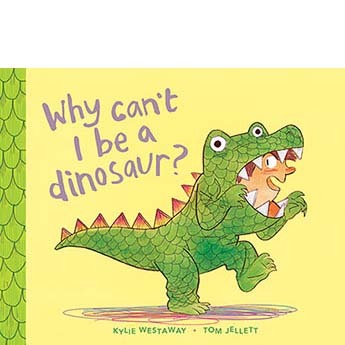 Why Can’t I be a Dinosaur? is a warm family story about determination and ingenuity – and a wedding with a difference.